A-HOTEL.com - Luxury and cheap accommodation in Perovo, Russia. Prices and hotel, apartment booking in Perovo and surrounding. Ryazanskiy Apartment is an accommodation situated in Moscow, 11 km from Zaryadye Park and 11 km from The Kremlin. Complimentary WiFi is offered. Set 10 km from Zaryadye Park in Moscow, Apartment on Perovskoe Shosse offers accommodation with a kitchen. This property is 11 km from The Kremlin. Hollywood Hostel is located in Moscow, 100 metres from Perovsky Park. Perovo Metro Station is within a 15-minute walk. Apartment na Perovo in Moscow provides accommodation with free WiFi, 7 km from Izmaylovsky Kremlin and 10 km from Zaryadye Park. Housed in a building dating from 1978, this apartment is 11 km from the The Kremlin. Boasting accommodation with a balcony, Апартаменты Перово 2 is located in Moscow. This apartment provides accommodation with free WiFi. Randevu hotel is located in Moscow, 1 km from Ryazansky Prospekt Metro Station. Free WiFi access is available. Apartment on Perovskaya is situated in Moscow, 8 km from Izmaylovsky Kremlin, in an area where hiking can be enjoyed. The apartment, housed in a building dating from 1972, is 11 km from the Zaryadye Park. Offering a fitness centre, Hotel Kristinn is located in the east of Moscow, a 15-minute walk from Perovo Metro Station. Free WiFi access is available. Located a 13-minute walk from Ryazansky Prospekt Metro Station in Moscow, Palacio Hotel offers a 24-hour front desk and free WiFi. The rooms feature air conditioning, a TV and a private bathroom. Set in Moscow, within 13 km of Zaryadye Park, Apartament Hanaka Mesherskiy 8 is an accommodation offering city views. This property is 14 km from The Kremlin and has free WiFi. Located in a residential area of Moscow, a 20-minute walk to Tekstilshchiki Metro Station, Mini Hotel Na Saratovskoy offers simple rooms with free Wi-Fi. The Red Square is 6 metro stops away. Located in the Ryazansky district of Moscow, just 10 km from Zaryadye Park, Апартаменты Люкс Текстильщики / Scandinavian Wind features air conditioning and free WiFi. This apartment is 10 km from The Kremlin. Situated 13 km from Zaryadye Park, 14 km from The Kremlin and 15 km from Lenin Mausoleum, Apartament Hanaka Novokyzminskaya 12 offers accommodation set in Moscow. The accommodation has free WiFi. Apartment Hanaka on Bratskaya 15 is located in Moscow, 8 km from Izmaylovsky Kremlin, 12 km from Zaryadye Park, as well as 12 km from The Kremlin. This apartment features accommodation with a balcony and free WiFi. This hotel in Moscow’s Kuzminki district offers classic-style rooms with free Wi-Fi, a hearty buffet breakfast and a 24-hour front desk. Kuzminki Metro Station is just 1 km away and Tekstilshchiki Metro Station is 1. Located within 9 km of Izmaylovsky Kremlin and 12 km of Zaryadye Park in Moscow, Apartament Hanaka Perovskaya 66 provides accommodation with a flat-screen TV. Complimentary WiFi is provided. Set in Moscow, 10 km from Zaryadye Park, Green Hostel Kuzminki provides air-conditioned rooms with free WiFi and express check-in and check-out. Conveniently situated in the Ryazansky district, this hostel is situated 11 km from The Kremlin. Hotel Uyut is offering accommodation in Moscow. 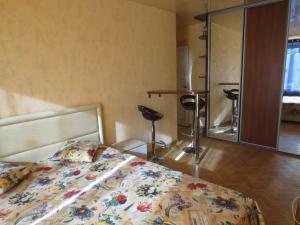 6 km from Izmaylovsky Kremlin, the property is also 9 km away from Zaryadye Park. Sadovoye Koltso Apartment Kuzminki is a self-catering accommodation located in Moscow, a 10-minute walk from Kuzminki Metro Station. Wi-Fi access is available. Located 10 km from Zaryadye Park and 11 km from The Kremlin, BestFlat24 Кузьминки is situated in Ryazansky of Moscow. The property is 11 km from Lenin Mausoleum.